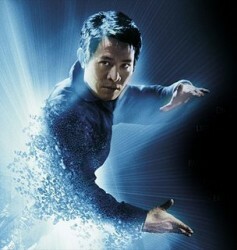 Yes, tomorrow the 26th, I turn 40 and Jet Li too, turns another year older. I love having the same birthday as such a cool and talented person! I’m very grateful that at this milestone birthday, my life, both inner and outer, is what I’d envisioned it to be when I was younger. However, when I was younger, I didn’t have hope that I could have my life be as I’d wanted it to. I can only give the credit where its due, to the man in my life whose inspired me, helped me feel the confidence to write and given me the support necessary to accomplish my goals. He also taught me to meditate, without which, I’d never be able to concentrate in the way necessary to write, for writing a book takes so much discipline once the inspiration has bubbled up. In that vein, I finished writing Flying Fish yesterday and I think it turned out pretty well. My critique partner Ruth, is looking at it right now and then I’ll go through it again and send it to my editor. Yes, it’s found a home at Loose Id. Yay! And will come out this summer, I believe, but I’ll keep you posted as far as release dates. I can’t wait to see the cover for this one!